At Westfield Friends, students in Sixth, Seventh, and Eighth grades are fully immersed in the curriculum and routines of the Middle School. Teachers work extensively with them on organizational skills—from keeping track of daily homework assignments and materials for morning classes to successfully managing and completing longer term assignments to allocating study time for major tests. Middle School students become more aware of their responsibilities, and the direct outcomes of their actions as they relate to their grades and future aspirations. Our Faculty and Administrators work as partners with the students and their families, helping them to find the right fit for high school choice and assisting throughout the application process. During sixth grade our goal is to increase our children’s sense of purpose, enhance their independent critical thinking, and build their self-confidence. Socially and emotionally, we focus on strengthening their self-image and self-respect, further enhancing their respect for those around them. Students become accustomed to having different teachers for their core subjects. In seventh and eighth grade, teachers work seamlessly to stimulate the children’s desire to learn, to foster their love of learning, to impart information and, more importantly, to learn processes that will help them find answers to their questions and communicate their thoughts to others. Students learn to work together as a group, but at the same time are allowed to develop their individual voice. We help students gain new, more sophisticated skills that will allow them to become responsible, independent thinkers and ensure students have the skills that will allow them to successfully enter the high school of their choice. Rigorous academics are at the backbone of preparing our Middle School Students for the high schools of their choice. Sixth graders study Medieval World History, Language Arts, Environmental, Earth, and Physical Science, Pre-Algebra, Latin, Spanish, Technology, Art, Music, and P.E. 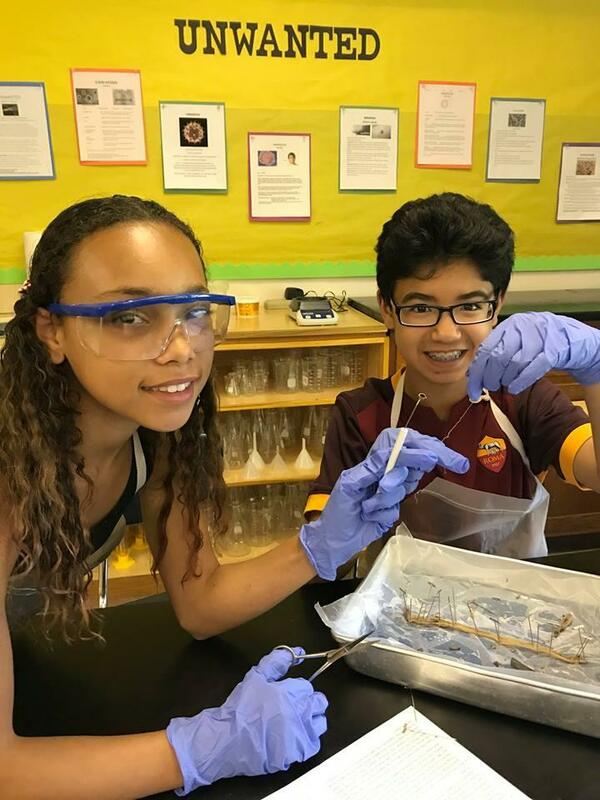 In seventh grade, our students take their first year of U.S. History, Language Arts with a focus on classic literature, a full year of Biology, Algebra I, Spanish, Latin, etc. Eighth graders move on to their second year of U.S. History which includes the study of government and constitution, Language Arts with a continued focus on literature, a full year of Chemistry, Advanced Algebra topics and/or Geometry, Latin, Spanish, etc. Various electives are offered to all Middle School students each half of the year. Westfield Friends provides a rigorous Mathematics education which meets the needs of all learners in the Middle School years. Students may test into our Accelerated Math program. Our graduates demonstrate strong Algebraic foundations which are built upon during high school and college math courses.